The CopyDisc 4 Platinum delivers easy to use, fully automated CD and DVD duplication. The standalone copier combines a small footprint with the renowned metal framework found on our entire range of CopyDisc Platinum units. The CopyDisc 4 Platinum will fit comfortably within any environment, be it an office or a professional production facility. The CopyDisc 4 Platinum is fitted with the very latest industry-leading CD-R or DVD ±R drives offering high-speed duplication of up to 220 discs at a time. All commands are entered via the control panel, blank discs are picked from the input spindle by a precision robotic arm and placed into the waiting drives. 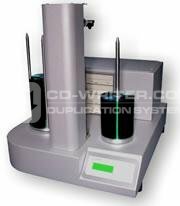 The CopyDisc 4 Platinum duplicator will then not only automatically detect the type of CD/DVD master without any user intervention, but will also provide "frame accurate" data and audio. All CopyDisc Platinum models are standalone which means that a PC is not required to operate them. However, as an alternative, it is also possible to network your CopyDisc using DiscPilot networking software, a factory fitted option that provides multiple users with access to a CopyDisc automatic duplicator. CopyDisk . 4 . Platinum . Copytrax .